Officially, Julian Jeff’s book, The Wines of Spain, has been cracked! For those of you unfamiliar with Julian Jeffs, he is considered one of the foremost writers on European wine, and has written several books solely on topic of Spanish and Portuguese wine. Julian began his career as a barrister in 1958, working as a QC, Bencher, and a deputy High Court Judge. Then, when he had few moments to spare, he just so happened to find time to be one of the founders of the Cambridge University Wine and Food Society, President of the Circle of Wine Writers, General Editor of the Faber wine books, all while writing his own books! When I have free time, I typically go hiking, have some tapas and read a book; whereas, our friend here creates organizations. As if this isn’t impressive enough, he not only wrote about the Sherry trade, but he also worked in Jerez de la Frontera to get some hands on experience. He is also part of the reading curriculum for the IWC (International Wine Center), a world renowned school certified to educate Wine Masters. In short, if I am to choose a book on Spanish wine, I feel absolutely confident he’s well-versed on the subject. So today, during my 45 minute train ride to Barcelona, where I typically fall asleep against the window as the car sways back and forth and the warmth of the sunrise gently falls upon my face tempting me to curl up like our cat Txarli, I boldly opened the book and began looking at a large map marking all 65 Denominacion de Origens laid before me. I, personally, am an enormous fan of maps, especially when they are both informative and cool looking. As I sit typing, I’m actually staring directly at three maps hung in our office: one of Barcelona, another of Madrid and the last of Portugal. Actually, if I turn around and look at the three other maps we have on the back wall of our office, the map marking all 65 D.O.s of Spain has Portugal distinguished as a gray blob that doesn’t really exist. This is another topic entirely that I won’t go into at the moment, but feel free to keep in the back of your head that Portugal’s nonexistence isn’t an infrequent occurrence on Spanish maps; whereas, Portuguese maps will typically include Spain. What intrigues me about Julian’s map, however, is that he marks each D.O. with a number but fails to ever give me a listing as to which D.O. correlates with which number, leaving me a little perplexed. Why have a map with numbers if the numbers are never explained? It’s paramount to me giving a tourist a map of Chicago with numbers representing each tourist point without a key and saying “I highly suggest you visit the Sears Tower, the Art Institute and the Aquarium”. If I didn’t have a cursory knowledge of Spanish wine regions, I’d still be scratching my head wondering what the hell the numbers referred to. Leaving the vague and pointless map behind me, I moved onto the Introduction. Now this is what I call “interesting”! What a better way to begin a book than with issues I, too, have wrestled with over the past year. Spain is a vast changing country containing several different distinct and unique regions. When I say unique, I truly mean that we have cultures like the Catalans who have their own profound history, culture, language and customs. In no way could you ever compare the Catalans with the Basques or the Madrileños with the Andalusians. They are completely different cultures with their language or dialect. What this means is that each grape may be written differently depending on whose perspective your taking it from. Just look at the region where Ryan and I live. In Catalan, we live in Cataluñya; in Spanish, we live in Cataluña; in Aranese (the third official language of the region), we live in Catalonhañ and in English, we live in Catalonia. I have constantly had difficulties knowing how to write a grape varietal or a region, never quite knowing which culture I should claim allegiance to at a given moment. Living in Cataluñya, should I spell it the Catalan way, or should I spell it the way English speakers will identify it on their map? Curiously, Julian mentions that he had to choose between English or the Spanish spelling for the book – electing Spanish, but never broached the subject as to the spelling based on the regional language or dialect. I’ll be curious to see if this holds true throughout the book. Another sticky point is that of gender. Like any romance language, Spanish is broken down into masculine and feminine nouns, where each noun is identified by an article, and sometimes, by a different spelling based on gender. I honestly have never considered this because I never thought this would be an issue when writing about a grape varietal. Not to say it isn’t logical, but not something I ever deemed important. Learning Spanish from the street, grammar is still something I’ve put on the back burner if it hasn’t helped me get my immediate needs and wants achieved. When I get my bread in the morning, I rarely think about whether my article is correct, trusting that my ear will guide me. It’s only when I royally screw up describing an individual in the wrong gender. For example, never say, “Eres muy guapo” (you are really attractive) to a female using male a descriptor if you want a date with her. You may not get too far! The second topic Julian tackles is that Spanish surnames, a very confusing topic for us English folk. In the Spanish culture, the wife doesn’t take on the name of their spouse; instead, she preserves her maiden name. A Spaniard will always have two surnames; the first from the paternal side and the second from the maternal side, sometime joined by a “y” or an “e” (in catalan) meaning “and”. Although, times have changed, allowing Spaniards to legally place either the mother’s or the father’s name first. Therefore, if you take a famous Spanish winemaker, such as Miguel Torres Vendrell, you most likely have only seen him presented as Miguel Torres. Like American legal names – typically containing a first, middle and last name – we will commonly identify ourselves only by our first name and surname, excluding the middle name entirely. The same holds true for Spaniards, where they leave out the second surname for both ease and convenience. 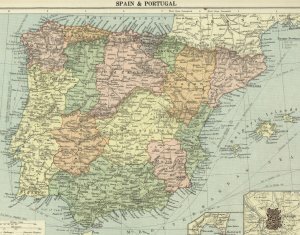 As a foreigner, I personally find the Spanish naming custom incredibly interesting being that Ryan and I have been lost as to whether or not we should place our middle name as our first surname, or if we just use our last name as our first surname dropping out the second surname entirely. Therefore, do I write Gabriella (first name) Reynes (first surname) Opaz (second surname) on my legal forms, or just Gabriella Opaz, continually leaving a Spaniard with a confused look on their face when they see that I only have one “legal” surname. For names like mine, regardless of what I choose, pronunciation hasn’t been an issue, providing me an easy way to identify myself when my name is called at any government or medical building. However, my dearest husband has an incredibly difficult problem identifying himself because if he isn’t aware of what to listen for, his name may be absolutely butchered. Ryan Anderson Opaz can give a Spaniard an absolute headache, unaware as to how one pronounces the “r” with the “y” or the entire name of “anderson”. The only example I could offer in reverse is when you try to pronounce wine labels from Spain, Portugual, France, etc. in their native languages. I can promise you that what I called the wines before I came to Spain sounds like a twangy southern accent as compared to what I know of them now that I live here. Finally, Julian discusses how you should decipher a winery’s address. If you’ve ever tried to find someone in the sticks with an address like “Happy Tree Road, km 2”, you probably know that you need both luck and a good Spidey-sense to find them. Poor Ryan has had many experiences in both Portugal and Spain looking for a winery that has no more information than Bodega X in X city, which makes the game “Where’s Waldo” seem like a cake walk. What is important to know, something for which Julian was smart to point out, is that if you see s/n (sin numero), it means that they have opted to drop a number entirely because it is pointless to have three buildings on an entire road with a number. Instead, they have opted to locate buildings using kilometer posts along the side of the road. Carretera “Terrassa-Sabadell km 2” means that the winery is located 2 km. on the main thoroughfare going from Terrassa to Sabadell. Personally, I like this methodology. Sure, you have to trust that the winery has made it absolutely clear with a big flashing sign where along km 2 they are located, but generally I find this easier than looking for a meaningless number among expansive areas of vines. So there you have it, the Introduction to Julian Jeffs’ book (I always feel like “Jeffs” shouldn’t have an “s” at the end, and that I am constantly making an error when I type it). The verdict: I’m content and am enjoying the ride reading this book. Granted, I’ve only read the first 15 pages, but it’s been 15 pages that I’ve enjoyed reading and chatting about. Let’s see if I can keep up this rhythm and pace as I dive into Chapter 1: The Spanish Wine Scene. Sounds cool, like an underground subculture filled with semi naked women serving vintage wines to prestigious wine dealers amongst the fermenting oak barrels deep within inside the secret wine caves. Hmmmm…maybe I’ll have a mystery novel by the end of the blog?